I was put off stir frying a long time ago as everything burnt on, especially round the sides of my so called "non stick" wok. Although I bought this to use for cooking for my elderly mum, which would mainly consist of curries and a savoury rice cooked in coconut milk which she loves and is very nutritious, I tried a stir fry. Nothing burnt on and I am extremely pleased. this is a very versatile pan indeed and well worth the money. 30 customers found this review helpful. Did you? Yes, I did! Delighted to receive my new wok! Falk cookware isn't just cookware...it's almost a member of the family. Each piece is so beautiful and is welcomed into the kitchen. This wok is no exception. It looks wonderful, weighs just under a ton, I should think, and cooks a mean meal. No chance of knocking this baby off the cooker. There it sits and sizzles happily, making meals for us. The steamer is a brilliant addition, once you realise that it sits in the wok with the little stick bit facing up! I had that facing down, to start with, and it is extremely hard to get it out again! Use the little stick...it's a "handle..."
Thank you, Neil and all your staff. Service is wonderful. Packing is perfect and your copper is delightful. 416 customers found this review helpful. Did you? Yes, I did! It's a great wok in and of itself, but the addition of the steamer just gives so many more options for what you can cook with it. Really pleased with this combination, highly recommendable! 385 customers found this review helpful. Did you? Yes, I did! A great steamer, used it also for stir frying vegetables and oriental food. The size is perfect! 437 customers found this review helpful. Did you? Yes, I did! Looks luxe. Great for any stir-fry or saute-ing. Perfect for 2-person household. 460 customers found this review helpful. Did you? Yes, I did! I have been coveting this wok for a long time, but felt like it was too extravagant a purchase as I already have a serviceable carbon steel wok that I've been using for many years. However, after knocking over my lightweight one-handled steel wok yet again, and re-seasoning it yet again...I decided it was worth the investment. Have not regretted it: the Falk wok has been put into constant service; it's great for stir frying and steaming, and I plan on using it for much more as time goes on. I just leave it on my stove top, ready for action. The copper means heat control is superlative, and the weight makes it extremely stable but it's not unwieldy. I prefer the loop handles - it means it can do double duty easily in the oven, so it's super versatile. And gorgeous. 532 customers found this review helpful. Did you? Yes, I did! Professional quality cookware, a wonderful addition to our kitchen implements. 485 customers found this review helpful. Did you? Yes, I did! This is an excellent wok for stir frying. The previous wok I had I needed to hold the handle so it doesn't move around. This wok is heavy enough so i don't need to do that anymore. Another plus is it maintains really high temperature so the food comes out nice and crisp and not soggy. 487 customers found this review helpful. Did you? Yes, I did! I love creating a stir fry for my family in my Falk Copper Wok and the steamer makes veges taste great with very little effort. 321 customers found this review helpful. Did you? Yes, I did! as usual,outstanding service, the wok was a birthday present for my son, already coveted by him from going on web site, a total surprise and such delight when he saw it i even got a hug!!! the only downside is that i am totally jealous!!! 438 customers found this review helpful. Did you? Yes, I did! An update after almost a year of use - i have found this to be a great pan for cooking Indian / Thai / Malaysian type curry, and for deep frying, e.g. tempura, tonkatsu etc. It offers great temperature control for simmering sauce or oil, and with sloped sides prevents use of excessive liquids/ sauce. But i don't think it is good for east asian stir fry dishes. It's heavy, and with loop handles a bit tricky to move on a high gas flame, and generally i think this is an application where copper -at least of this thickness- offers no benefit. Instead i would choose the cheaper, lighter and superior steel option. So as far as ratings go, i would say for cooking curry-5 stars, for stir frying maybe 2 stars. But as this is advertised as a Wok, i.e. east asian cooking vessel, which people might consider primarily for stir frying, then i don't think i would recommend it. 349 customers found this review helpful. Did you? Yes, I did! 463 customers found this review helpful. Did you? Yes, I did! 458 customers found this review helpful. Did you? Yes, I did! 486 customers found this review helpful. Did you? Yes, I did! I am impressed with the quality of these cookware and thickness of the copper used. It is shear joy to cook in this wok. it is surprising that the cooking surface is as good as a non stick surface. The website is well laid out, making shoping experience a breeze. the costomer service is amongst the best that I have come accross with personal touch. well done. 506 customers found this review helpful. Did you? Yes, I did! I was very impressed with this beauty and in particular the fine service I received from Falk. 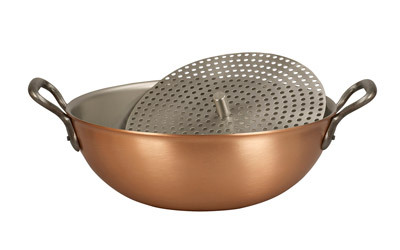 This item is perfect for stir frying and steaming. You can get a whole shredded cabbage in this, which tastes much better steamed than boiled in my humble opinion. My 5 stars are for both the product itself and the top-notch customer service!! 585 customers found this review helpful. Did you? Yes, I did!